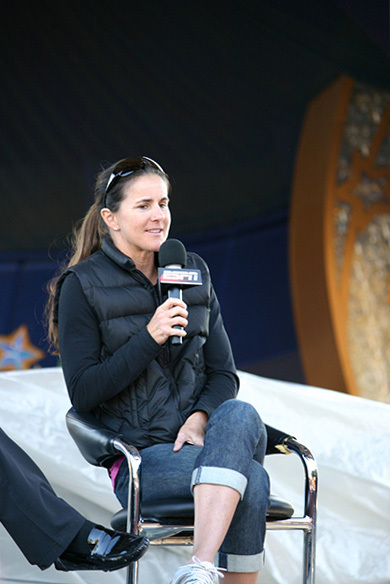 Retired soccer player Brandi Chastain will host a soccer clinic at ETHS in June. Chastain has previously played for the USA National Team and works as a commentator for ESPN. Brandi Chastain, the United States women’s soccer team player who made the game-winning penalty kick in the 1999 FIFA World Cup tournament, will be coming to Evanston to hold a soccer camp this summer. The Team Evanston Soccer Club’s coaching director Issac Moushi invited Chastain to host the all-girls camp at Evanston Township High School from June 24 to 28. Chastain is well known for her postgame celebration in the 1999 FIFA World Cup, when she ripped off her shirt following her successful penalty kick, making the covers of Time, Sports Illustrated and Newsweek. The kick concluded a match between the United States and China, which had been scoreless after regulation. In addition to her FIFA appearances, Chastain has won two gold medals and one silver medal in her Olympic appearances. Moushi said 20 students have registered so far, and he expects the 160 available spots to be filled by summer. Chastain currently lives in San Jose, Calif., and plays with the California Storm in the Women’s Premier Soccer League. She also works as an analyst for NBC and covered soccer tournaments in the 2012 London Olympics.